Daniela Petrelli from the University of Sheffield is visiting the IDC as part of the "Memoir" Project. At Sheffield, Daniela teaches electronic publishing, digital multimedia and web-design. Daniela moved to the UK in 2000 and previously I was a researcher at IRST in Trento, Italy where she did research on adaptive and mobile guides for museums, natural-language based interaction, intelligent interface interaction. 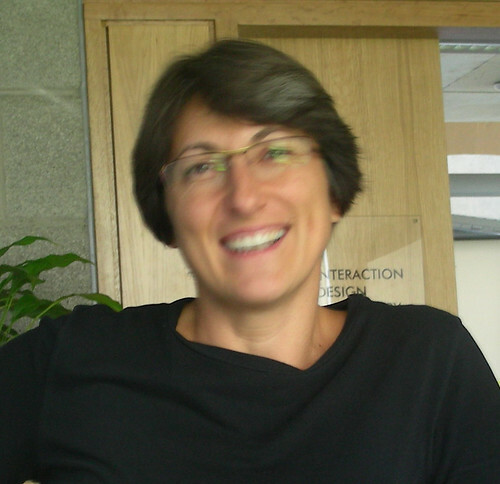 In a far past (1990-1993) she was at the Italian Telecon Research centre and worked on CSCW and teleconferencing systems mainly doing interface design and development. The Memoir project will last for 4 years and is about the capturing, storage, organization, retrieval and sharing of multimedia personal memories. Personal memories are intended at large: email, documents (word, excel, powerpoint), messages on the phone, personal pictures, videos etc. Accessing means not today but in 10, 20 or more years time. - 3 senior visiting fellows for 3 months on: ethics of memories, psychology of memories, social history. The goal is to design a something to facilitate the capturing composition and sharing of the memories across generations of tightly connected people. Posted by Lui at 3:33 p.m.